Every travel day is unique, with some easier than others, some longer than others, some more complicated than others, and so forth. We plan as well as we can and then hope the day unfolds according to plan. Thankfully everything went as planned on our journey from Bordeaux to Florence, but turned out to take longer and be more tiring than we imagined, and we arrived at our Airbnb feeling absolutely exhausted. It will take us a couple of days to get back up to speed before we can set out to explore and savor the city and the countryside. 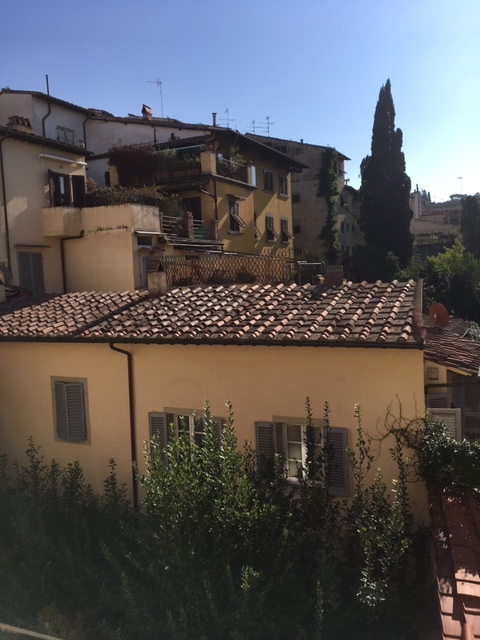 We thankfully have the time in Florence to do just that – four weeks to be exact – and a couple of days of rest won’t impact any schedule or a limited amount of days. 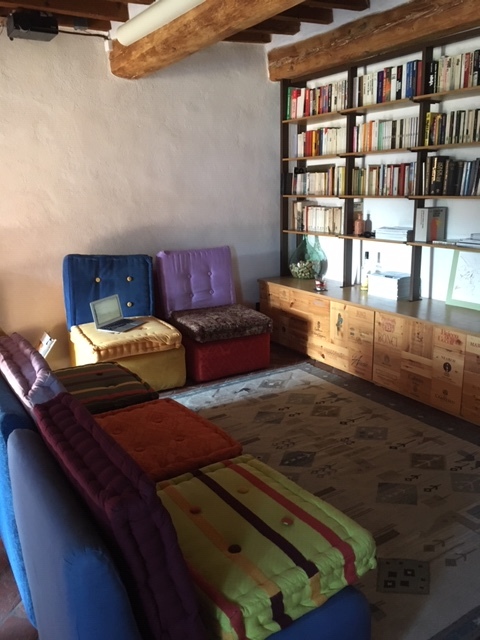 The apartment living room – the books are in Italian and English. Our host and his wife custom made the cabinets from wine crates. Our apartment for the next month is positively charming, and everything I hoped it would be when I selected it. 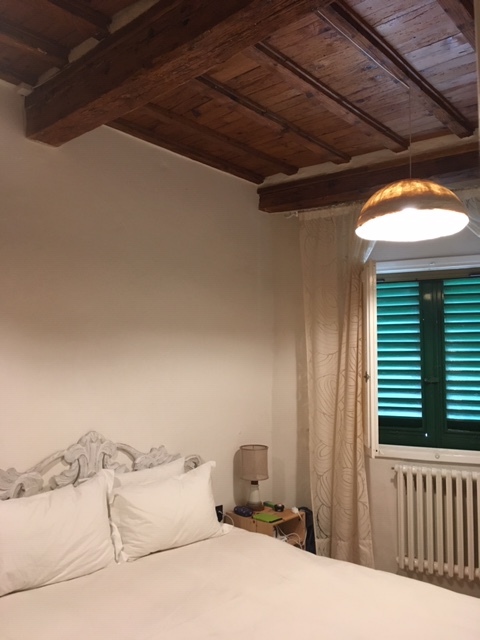 The building is hundreds of years old, and the apartment was lovingly restored by the host and his wife, with custom cabinets made from wine crates. The kitchen is extremely well equipped (with a dishwasher!) and the bed is very comfortable. There’s a washing machine too, thank goodness. If we have to find something to complain about it’s that the bathroom is very tiny. But, it’s clean and modern and we will adapt. The kitchen is small but very well equipped. And that view! The owners discovered this old fresco of a drill during their renovation of the apartment. Both of us fell asleep early last night and slept late this morning. I woke up with a stuffy head, but that cleared up quickly and my cold appears to be almost gone. Brett and I unpacked our suitcases and put away our clothes, and then put the suitcases away in the spare bedroom where we won’t have to look at them for a month! Our host left us wine, juice, soft drinks, water and snacks, but we walked to a nearby market today, just around the corner and down the street, and between what the host left and what we picked up at the market we’re set for several days. We enjoyed a delicious onion foccacia for lunch, and the rest of the day will be spent napping and reading and recovering from yesterday’s journey. The shuttered windows look out over the street, but keep the bedroom nice and dark. 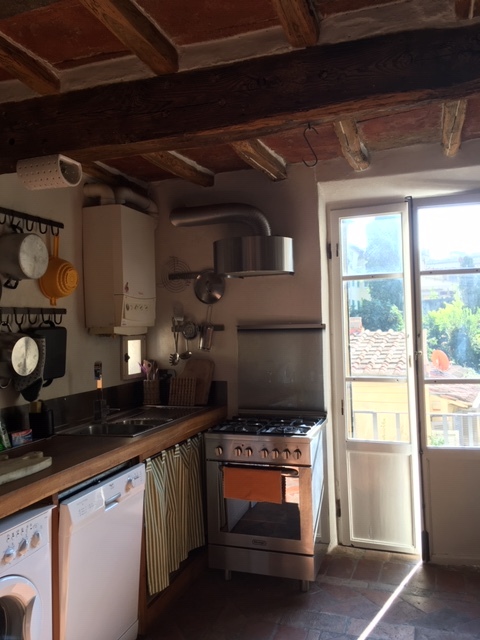 One thing I already know about our time in Florence: my mornings will be spent with a cup of coffee in front of the kitchen window absorbing that view! Sounds perfect. can’t wait to see and read about this part of the trip. We’re excited to be here and looking forward to getting out to explore. The change from listening to French and now Italian it was a bit jarring, but we’re adjusting ;-). The apartment interiors I was expecting, but the view was an added bonus (there’s a picture included in the Airbnb offering but it doesn’t do it justice). I think another day of rest tomorrow, with maybe one small, nearby outing and we will be good to go. I can’t believe how tired I am otherwise – we spent over 12 hours traveling yesterday. The apartment looks amazing. I wonder what the full fresco looked like. 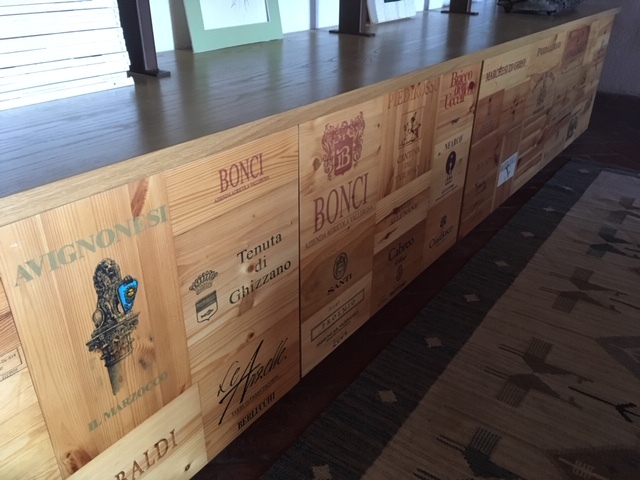 Such a neat idea to make the cabinets from wine crates. I am so glad we are here for a month – I was so tired today and so glad we did not feel any pressure to get out and see things. The wine crate cabinets looks more rustic on the Airbnb site, but they are beautifully finished and fit the decor of the apartment perfectly. 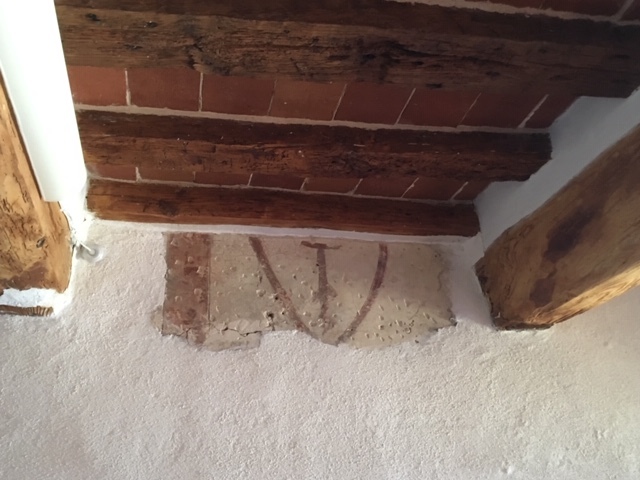 The owner of course wonders if there is more to the fresco than what they uncovered, but they have moved to a bigger and more child-friendly space (they have two children under the age of three) so he said this is where the renovation/discovery had to stop. Cute apartment ! You haven’t said a lot about the beds along the way! Have they all been comfy? Sometimes when we are out of town, I am so glad when we are back in our own bed. However, we went to Leavenworth a few weeks ago for our Anniversary and we had the best bed ever! Glad you are feeling better and yes, hoping Brett doesn’t get it!!! I was really excited about coming to this apartment, and it’s even better in reality than in the pictures! The bathroom is pretty tiny though, but it works. LOL about the beds – before we have checked in at every place so far we wonder, “is this going to the place with the uncomfortable bed?” but so far all the beds have been VERY comfortable, even the sofa bed we slept on for three weeks in Strasbourg. I think every bed so far has been memory foam – we are now sold on getting one whenever we settle down. Brett is doing fine so far, and I am almost over this cold (although the other day I was calling it The Cold That Will Not End). Brett rarely gets sick, and it looks like he’ll stay that way for now. He has an incredible immune system, built up I think over all those many years he lived in close quarters on ships. I am so happy with this apartment – we think it’s going to be a fun place to stay for the next month. We’re just a short distance down from the Ponte Vecchio, so may walk down there and back tomorrow and see how it goes. On Thursday we need to walk to the station and buy our train tickets to Riomaggiore (Cinque Terre)!